Mr. Juergens is an associate editor of Pensée. This is the first part of a two-part paper. According to Velikovsky's collation of ancient historical accounts, the most recent period of turmoil in the solar system ended less than 2700 years ago (1). Territorial disputes that continued for nearly a full century brought Venus, Mars, the earth, and the moon into repeated conflicts, scarring all of them to varying degrees. And since all this happened so very recently in geologic time, most of these battle scars should still be prominent and fresh-looking. But what kind of surface markings might be distinctively attributable to close encounters between planets? Religious, historical, and literary texts describing the battles of the planetary gods are fraught with references to cosmic lightnings and thunderbolts. The implication, emphasized by Velikovsky in numerous writings, is that electric discharges took place between the planetary bodies during their close approaches. Furthermore, such discharges were evidently of such magnitude as to be visible from earth even when they did not actually terminate on earth. They must therefore have involved enormous exchanges of energy and have produced scars of commensurate proportions. In this and in a sequel article, I intend to suggest that electrical scars of vast proportions are indeed in evidence, particularly on the surfaces of Mars and the moon. I will emphasize that it is just such markings that constitute the most recent features of these bodies. Velikovsky quotes Pliny's description of a cosmic thunderbolt: "Heavenly fire is spit forth by the planet as crackling charcoal flies from a burning log" (2). This homely simile seems congruent with ancient artistic tradition; early Greek sculptors portraying Zeus, for example, poised him like a quarterback about to launch a football-shaped thunderbolt (3). The impression gained from both these lines of evidence is that the thunderbolts thus referred to and depicted were not luminous streamers akin to atmospheric lightning, but luminous "objects" of missile-like proportions. If so, it seems likely that such thunderbolts were of the nature of the plasmoids described some years ago by Winston Bostick of Stevens Institute of Technology (4). These objects—"pieces of plasma" with "unexpected capacity for maintaining their identity"—were fired from the electrodes of a "plasma gun." They emerged from the gun in doughnut form, then expanded axially to form long cylinders. When fired into a thin gas, they bent themselves double and twisted into forms resembling screws. This suggests, if we are correct in equating plasmoids and cosmic thunderbolts, that the early Greek sculptors may have detailed the thunderbolts of Zeus with screwlike twists at each end on the basis of accurate descriptions passed down by their ancestors. While such plasmoids are created in the laboratory by an electric discharge at the "muzzle" of a plasma gun, they are not transporters of electric charge; their plasma consists of essentially equal numbers of electrons and positive ions. The same could well be true of a cosmic thunderbolt, and its impact site, though impressive, might be indistinguishable from an explosion crater produced by the impact of a meteoroid (5). Thus, finding an explosion crater less than 3000 years old, though it would upset a number of theories now current among scientists, would be of little help in solving the problem we have posed. What we seek is some fairly unequivocal evidence of electrical scarring—evidence suggesting that electric charges actually were exchanged, with one body serving as the cathode ("negative electrode") and the other as the anode ("positive electrode"). In such an exchange, the scarring sustained by one body would be different from that sustained by the other. But there are four bodies under consideration. Which two make a pair offering the best prospects for the present inquiry? Perhaps Homer has passed along a useful clue: The Greeks attributed the forging of thunderbolts to Hephaistos. Homer further recounts that Hephaistos forged a net, "fine as gossamer but quite unbreakable," which he used to entangle his wife, unfaithful Aphrodite (the moon) and her tempestuous lover, Ares (the planet Mars), and bind them together long enough for several other gods to come by and make sport of them (6). Could this net have been another of Hephaistos' electrical artifacts? This question occurred to me one day as I was leafing through a newly purchased paperback with the rather unexciting title Gaseous Conductors—Theory and Engineering Applications (7). There on page 189 was a photograph of two spheres with sparks streaming between them. The photo caption and accompanying text described the phenomenon as the "formative stages of sphere-gap breakdown . . ." with "well-defined spark channels being propagated from anode to cathode. In addition, there is evidence of a glow discharge throughout the gap." My mind's eye saw Mars and the moon struggling to part from one another in the skies of the eighth century. Is it conceivable that Mars and the moon could have been intimately bound—presumably orbiting one another at close range—by gravitational and electromagnetic forces and joined by electrical streamers for so long a period-hours? days?—as to give rise to Homer's outrageous tale? More pointedly, could sparks have reached out and bridged empty space between two planets orbiting at a distance great enough to spare them gravitational disruption? I came across an affirmative answer to this last question in Leonard Loeb's Fundamentals of Electricity and Magnetism (8). Discussing vacuum sparks, Loeb relates an anecdote to show that, while theory might suggest that sparks—gas-breakdown phenomena—are impossible in a vacuum, industrial experience shows them to be not only possible, but all too frequent and troublesome. He explains that "somehow the spark must create its own gas." The mechanism involves the emission of electrons by solids in the presence of strong electric fields. These electrons, literally "pulled out" of the solid materials, shoot across the vacuum gap to the anode, where they liberate gas and ionize it. Positive ions thus formed then "thread" their way back to the electron source as luminous streamers. Upon striking the cathode, the ions often fuse its surface and form a crater at the point of impact. If the electrodes have not been carefully out-gassed in advance, enough gas may be generated to lead to a general breakdown in the gap, and a power arc even more destructive to the cathode may be ignited in the gap. If sparks can thus be produced in laboratory and industrial vacua, it seems within reason to suppose that the same thing can happen in the near-vacuum of interplanetary space. The question remains as to just how Mars and the moon might have been so long detained as to give rise to the love-affair story. Clearly there are many factors to be considered: electrostatic, electromagnetic, and gravitational forces between the two bodies during approach, congress, and separation; influences of the nearby earth on both the participants; influences of Venus, which was in and out of these celestial battles; and whatever effects the sun itself may have had. But this is a problem outside the boundaries of the present inquiry. The moon, with no atmosphere and therefore no weather to alter its features, seems the logical place to look first for scars of electrical origin. Immediately we face a problem, however. Seeming evidence of violent electrical activity on the moon is so abundant that we are hard-put to decide which scars to examine first. For example, British amateur astronomer Brian J. Ford published a paper some years ago in which he presented a strong case for the idea that most of the craters on the moon are marks left by electrical discharges on a cosmic scale (9). He backed up his arguments with a report on laboratory experiments in which he had used spark-machining apparatus to reproduce in miniature such otherwise-mysterious features of the moon as craters with central peaks, small craters preferentially perched on the high rims of larger craters, and craters strung out in long chains. Then there are the rayed craters, which from all appearances are the freshest craters on the moon. Velikovsky is on record (10) as believing them to be discharge craters, as distinct from others without rays-for which he favors a gas-bubble origin (11). But rayed craters, though relatively few in number among all lunar craters, are still so abundant as to be confusing (12). And there is more evidence to be sifted. Some or all of the lunar remanent magnetism-such a surprise to science when the first moon rocks were returned to earth, although it had been urgently predicted by Velikovsky (13)-could be due to cosmic electrical discharges. It is no secret that terrestrial lightning strokes to rocky surfaces, while sometimes fusing materials to form glassy fulgurites, also magnetize surrounding rocks without melting them. All these lunar phenomena will bear intense study. For now, however, I would call the reader's attention to yet another type of sear on the face of the moon. Lowland areas on the near side of the moon are gouged with peculiar valleys, or clefts, now widely referred to as rilles. Many such rilles cut nearly straight lines between points of no apparent significance and appear to follow crustal faults that pierce high and low ground alike. Some are gently arcuate, paralleling the "shores" of lunar maria, as if to suggest that tensile forces rifting the moon's surface formations were responsible for them. Others, upon close inspection, are seen to be strings of closely spaced craters that could be volcanoes, subsidence features, or as Ford suggests, discharge effects. To one degree or another, all these lunar rilles seem to have counterparts in familiar terrestrial features. But there are still others—the sinuous rilles—that come so tantalizingly close, yet finally fail to measure up to suggested similar features on earth, that they have become a subject of great controversy. I believe that the sinuous rilles may be part of the evidence we seek—evidence of the Moon-Mars encounters of only a few thousand years ago. Sinuous rilles meander across the landscape of the moon for distances as great as 300 kilometers. Schroeter's Valley, largest and most conspicuous of these tortuous excavations, has been recognized since 1788, but for more than a century it was dismissed as just another "crack" (14) At the turn of the twentieth century, however, W. H. Pickering announced that, from a favored vantage point high in the thin air of the Peruvian Andes, he had observed scores of sinuous rilles on the moon. He described them as "a new kind of rill" and confidently pronounced them to be "riverbeds" (15). Pickering attributed these special characteristics to his "riverbeds": (i) they "are always wider at one end than at the other;" (ii) the "wide end always terminates in a pear-shaped craterlet;" (iii) "their length is composed almost entirely of curves of very short radius;" and (iv) "one end [the broader end] is nearly always perceptibly higher than the other." This last characteristic prompted him to remark: "But here we come to a very marked distinction from terrestrial rivers, for in the lunar rill the apparent mouth is always higher than the source. What this means, of course, is that if formed by the action of water, as seems from their appearance probable, the lake flowed into a river, and not the river into a lake" (16). Since few astronomers were disposed to believe that water could flow on an airless (and probably waterless) planet like the moon, Pickering's identification of the sinuous rilles as riverbeds met with considerable ridicule and helped to earn him a reputation among his colleagues as something of a crank (17). In the late 1960's, however, Pickering's idea won the support of Harold Urey. Lunar-Orbiter photographs had revealed hundreds of sinuous rilles, and some of them certainly resembled erosion channels. But one problem that had always plagued the riverbed theory, aside from that of providing water on the moon, was that, with one or two questionable exceptions, the imaginary lunar rivers had left no delta deposits or other evidence of outwash materials unloaded at their lower ends. Urey, seizing upon Thomas Gold's suggestion that the lunar maria might be underlain by a permafrost layer of "plastic ice" (18), argued that riverbeds carved in ice would yield detritus consisting mostly of ice, and such material would wash out at the foot of the stream and melt, evaporate, and eventually escape into space, leaving no evidence behind (19). But John A. O'Keefe, of NASA's Goddard Space Flight Center, countered by showing, among other things, that the viscosity of ice is such that craters more than one kilometer in diameter, blasted in permafrost, would quickly be destroyed by gravitational action; similarly, Schroeter's Valley, if cut in ice, "would disappear within a year, even if the ice were protected from melting by an overburden of soil" (20). O'Keefe suggested that the missing-delta problem was best solved by supposing that dense flows of volcanic ash had carved the sinuous rilles and then had dispersed over the surface as dust-laden gas clouds—an idea he had published some years earlier in collaboration with E. W. Adams (21). Even before that, O'Keefe's Goddard colleague, Winifred S. Cameron, had proposed that the sinuous rilles were excavated by the lunar equivalent of a terrestrial nuée ardente-a dense cloud of hot gas and ash that explodes from the side of a volcano and rolls down the Mountainside, cutting a new valley as it goes (22). In support of this hypothesis, attention was directed to the known self-cohesive powers of nuées ardentes and to their demonstrated ability to flow great distances on extremely gradual slopes. But this theory, too, failed to account for the material gouged out of sinuous-rille channels. In spite of O'Keefe's arguments based on the impermanence of features carved in permafrost, the idea of ice on the moon persisted right up to the time of the first Apollo landing in July 1969. Lunar-Orbiter revelations that Schroeter's Valley and another nearby rille, Rima Prinz I, contain secondary meandering channels in their bottoms inspired Richard E. Lingenfelter, Stanton J. Peale, and Gerald Schubert of the University of California, Los Angeles, to propose an elaboration of Urey's hypothesis (23). The abstract of their report summarizes their main arguments: "Mature meanders in lunar sinuous rills strongly suggests [sic] that the rills are features of surface erosion by water. Such erosion could occur under a pressurizing ice cover in the absence of a lunar atmosphere. Water, outgassed from the lunar interior and trapped beneath a layer of permafrost, could be released by a meteoritic impact and overflow the crater to form an ice-covered river. A sinuous rill could be eroded in about 100 years." The UCLA authors also argued that, since rilles are typically of great width relative to the equilibrium thickness of the required ice blanket, "we would not expect the ice to restrict the river's course or hinder the development of meanders. . . ." Furthermore, "because there is no abrupt change in gradient at the end of the rills, we would expect deposition of the stream load to be relatively thin and to cover a larger area." J. E. M. Adler and J. W. Salisbury of Air Force Cambridge Research Laboratories, "intrigued by the novel suggestion by Lingenfelter et al. . . ." undertook to model the process in a vacuum chamber. They found that in their vacuum tests ice formed, and "water continued to flow under the ice ... but it did not necessarily flow downhill. Instead, it percolated through the soil following the greatest pressure gradient, breaking through to the surface first in one place and then in another." Eventually the entire test area became covered with ice. But after this ice was sublimed away, they found that, "although there had been some downslope movement of the soil,... no stream channels were ever developed" (24). 1. Rima Prinz I, instead of continuing, river-fashion, down a slope it has been following, makes a 90-degree bend and proceeds on a course "parallel to regional contours." 2. Rima Prinz II crosses a ridge that should have turned it aside, were it being cut by flowing water. 3. The sinuous rille in the bottom of Schroeter's Valley passes through the valley wall and at least two ridges before it tails out and disappears. 4. "The 'Pseudo-meanders' associated with the lunar channels do not resemble the meander pattern of terrestrial rivers." 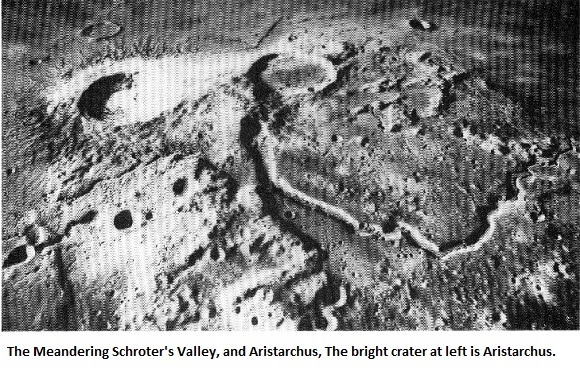 Schumm and Simons then argued that "the emission of gas along fractures, which control the courses of channels near Prinz Crater and in Schroeter's Valley, would have formed chains of circular and elongate craters, which upon coalescence could have become the lunar channels" (25). Schumm followed this up with some experiments of his own. Forcing air through holes and slots in the top of a duct buried under a mixture of dust and sand, he claimed to have simulated such lunar features as explosion craters, crater chains, and sinuous rilles; this, he said, leaves "little doubt that some crater chains, crater clusters, and sinuous rilles are the result of endogenic processes and probably are the result of fluidization of lunar regolith [soil] by gases venting from fractures in the lunar crust" (26). After it had been decided by NASA that Hadley Rille (Rima Hadley) at the base of the Apennine Mountains would be visited by the Apollo 15 astronauts, Ronald Greeley of Ames Research Center undertook a detailed analysis of the Orbiter photographs of that region. He concluded that Hadley Rille is a collapsed lava tube (27). 1. "The rille narrows 'downstream,' rather than widens as is normal for rivers." 2. "The rille is discontinuous, a situation not possible for fluvial channels, but quite common in lava tubes and channels." 3. "The average mare regolith thickness [is]... much less than the several hundred meters required by water erosion of short duration." 4. "Hadley Rille is situated on the crest of a topographic high ... It is unlikely that any erosive agent, whether ash or water, could have cut a channel along the top of a ridge" (28). Greeley then suggested that a lava stream could produce a ridge and a channel simultaneously by overflowing its banks to form levees. He conceded that outgassing processes, such as those proposed by Schumm, could also produce lateral levees, but he cited as practically insurmountable the difficulty of imagining a crustal fracture as sinuous as Hadley Rille. 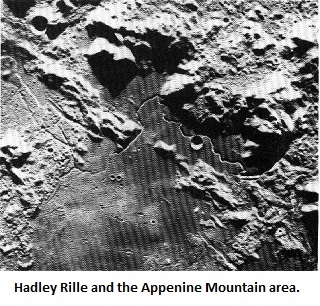 To round out the lava-tube hypothesis, Greeley suggested that the (then-apparent) discontinuities in Hadley Rille are bridges -remnants of the lava-tube roof not yet broken down by meteoritic bombardment. 1. Terrestrial lava tubes and channels do not exhibit meanders, goosenecks, central meander channels, or the lengths of lunar sinuous rilles. 2. "The distinguishing features of terrestrial lava channels, namely discontinuities (bridges) and raised rims, are not found in the lunar sinuous rilles, contrary to the earth-based observations of Kuiper et al." (30). The Apollo 15 mission to the moon closed the door on several of these theories, although this was not emphasized in the preliminary report of the Apollo Lunar Geology Investigation Team (31). Photographs taken from lunar orbit by Astronaut Alfred M. Worden showed conclusively that Hadley Rille is not discontinuous; what had been mistaken in the Orbiter photo-mosaics for breaks in the channel are actually "shallow septa," or low ridges, between "coalescing elongate bowls." The mission established that "subtle raised rims are locally present along the rille," and that rim-height and mare-elevation differences from one side of the rille to the other occur at sharp bends in the channel. The latter point was taken as a possible indication that lava flowing in the channel might have overtopped the rim at such bends (32). But the bends referred to, though "sharp" in relation to other bends in the Hadley Rille channel, are in no way of such short radius as to cause flowing water to top the banks, much less sluggish lava. A crude scaling of the photograph indicates that the sharpest bend in Hadley Rille has a radius of the order of half a kilometer. Orbiter and Apollo photographs of Hadley Rille fail to show anything at its lower end that could be convincingly described as an outwash deposit, either of water-borne materials or of lava. Yet, by Greeley's estimate, the volume of the rille is 2.8 x 1011 cubic meters-a significant quantity of material to be accounted for (33). The only such accounting attempted by the same author, however, is found in a speculation that "multiple surges of lava from the vent, or possibly multiple eruptions over a long period of time resulted in overflow of lava from the main channel through distributary channels and tubes ... to build a topographic high along the rille axis" (34). Greeley offers no suggestion as to how a valley 400 meters deep might have emptied itself completely by overflowing. Terrestrial lava tubes form within active lava flows, and they represent hollows left behind in cooling, already-viscous lava when hotter, less-viscous material in the core of the stream continues to flow on ahead. The stratification observed and photographed in the walls of Hadley Rille by the Apollo 15 astronauts in no way fits the idea that the rille formed as a lava tube (35); "there is no obvious way that lava could cut cleanly through an entire series of layers [rock formations]" (36). In 1970 University of Pittsburgh scientists Bruce Hapke and Benn Greenspan, using Lunar-Orbiter photographs, counted craters in the vicinities of four sinuous rilles and announced some significant findings that were largely ignored (37). The general assumption is that the more heavily cratered a lunar surface is, the older it must be, having been subjected to meteoritic infall for a longer time than a less-heavily cratered area nearby. A sinuous rille cut into a mare surface is obviously younger than the mare. But Hapke and Greenspan found that in three out of four cases, crater densities were significantly greater on the floors of the rilles than on adjacent mare surfaces. In the fourth case, densities were greater on the surrounding mare, but the region "appears to have been heavily cratered by secondary ejecta from Aristarchus," one of the freshest-looking craters on the moon. Hapke and Greenspan interpreted their findings as an indication that at least some of the rille-floor craters are not impact craters, and indeed must have something to do with the formation of the rille. They concluded that their results argue "against those hypotheses for the origin of sinuous rilles by simple down-cutting by a moving fluid." All fluid-erosion theorists from Pickering on down have chosen to ignore a matter first emphasized by Pickering himself and re-emphasized by Greeley: The "apparent mouth" of the "stream" is on high ground, and the narrowest part of the channel is on lower ground. The situation should be exactly reversed. As an erosion channel lengthens, more and more spoil must be carried by the eroding fluid, and the channel must grow wider to accommodate the load. Perhaps the mistaken assumption in all this is that the flow responsible for sinuous rilles on the moon was in response to gravity. Is it entirely beyond reason to ask whether some sort of reversed, or "uphill," flow might have been involved? We are looking for evidence of recent electrical disturbances on the moon-disturbances that might be related to the dalliance of the moon with Mars only a few thousand years ago. So let us be forthright and frame the inquiry in appropriate terms. 1. Before the encounter, both Mars and the moon would be more or less in electrical equilibrium with the local interplanetary plasma. Their surface potentials, if not precisely equal, would be similar. But Mars, being almost twice the size of the moon, would have to carry roughly twice the negative charge of the moon to have the same surface potential. 3. Considerable difficulty arises when we try to imagine precisely what might take place between three electrified bodies in such close proximity. For now, I suggest that we consider the moon and Mars to have been sufficiently far from the earth during this incident that the earth's influence can be neglected in a preliminary analysis. 4. In anticipation of various lines of evidence to be brought out in what follows, I beg the reader's indulgence in permitting me to postulate yet another condition: Mars, although it enters the fray with greater net negative charge than the moon, suffers a drastic redistribution of its charges as the encounter develops, so that when discharging is initiated, a limited area on the surface of Mars actually assumes the anode role. How this might come about is a matter I intend to discuss after the evidence has been presented. We have already noted a condition to be fulfilled in igniting a discharge in vacuum: the electric field between anode and cathode must build to an intensity great enough to "pull" electrons from the cathode by sheer force. This is difficult enough when the cathode is made of metal; tearing electrons from non-conducting lunar crustal materials and in numbers sufficient to trigger an interplanetary discharge must involve birth throes of considerable violence. On the moon, then, as Mars approaches, we may visualize an external electric field that is intensified here and there by local surface elevations. (For the present, we consider only phenomena taking place on the relatively flat maria, or lowland regions of the moon.) Electrons in local rock formations strain at their bonds and attempt to move toward one or another point of field concentration, but they are prevented from doing so because of their bonds. As a result, a radial electric field is set up around each center of intense stress. To simplify matters, consider what follows in just one such locality. The radial field beckons equally in all directions, insofar as topography and lunar materials are alike in all directions. But no electron-flow of any consequence can start until, at some point or some few points, electrical breakdown is initiated (39). 1. Everywhere else the radial ground field weakens as lines of force concentrate at the outer tip of the breakdown zone. 2. In a flash, the tiny breakdown point becomes a breakdown path propagating itself outward from the starting point, turning this way and that as the intense field at its tip probes for weaknesses in the rock strata. 3. Heat generated by the breakdown process liberates gases and generates plasmas that blast upward through overlying formations and excavate a vast trench. The exploding trench, propagating as fast as the underground breakdown channel, tears hundreds of kilometers across the lunar surface at lightning speed. 4. The initial surge of electrons, upon reaching the local high point where the breakdown started, blasts out a large, irregular crater as it surfaces and launches itself into space in response to the external field. 5. Electrons from more distant parts of the breakdown channel find the external field at various points along the developing explosion channel stronger than that directed along their underground path, and they blast upward short of the main terminus, creating on-channel craters at numerous points. This, of course, is all conjecture. But it can be argued that an underground breakdown channel, if not too deep to begin with, should show the salient features of a lunar sinuous rille: (i) a sinuous course, trending generally uphill toward a local high point, but straying occasionally along topographic contour lines and even plowing through an intermediate ridge or two on occasion; (ii) a narrowing toward the downslope end; (iii) gently leveed banks, due to some upthrusting of adjacent strata as well as to a concentration of ejecta on the trench rims; (iv) a lack of "outwash" deposits beyond the downhill end; (v) occasional or even coalescing on-line craters; and (vi) a prominent explosion crater or irregular basin at the higher end. 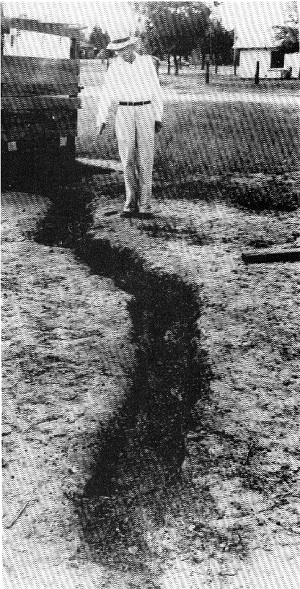 Peter E. Viemeister points out that lightning has been known to dig "a furrow-like trench" and even leave "a strange trail of holes in the ground" (40). Much more impressive, however, is a photograph reproduced in the National Geographic Magazine for June 1950. The caption of the picture informs us that "Lightning Gouged This 40-foot Trench," and the text further informs us that "three baseball players were killed when a bolt furrowed the infield during a game at Baker, Florida, in 1949 ... Ground's resistance to current 'blew' the earth like a fuse." This photo shows a zigzag excavation roughly 18 inches across and about 6 inches or so deep. The debris from the explosion is spread to both sides of the trench, perhaps six feet each way, and it is so thinly deposited that blades of infield grass can be seen poking through it. Vaguely visible is a marking in the trench bottom that suggests that the hottest part of the current channel meandered even more than the gross outlines of the trench itself. And, just as one example of the excavating prowess of electricity, A. W. Grabau cites this occurrence: "In Fetlar, one of the Shetland Islands, a solid mass of rock 105 feet long, 10 feet broad, and in some places more than 4 feet high, was in an instant torn from its bed by lightning and broken into three large and several small fragments ... [One fragment], 28 feet long, 17 feet broad, and 5 feet in thickness, was hurled across a high point of rock to a distance of 50 yards. Another broken mass, about 40 feet long, was thrown still farther, but in the same direction, and quite into the sea . . ." (41). of a ridge. But the dipping strata are not lava deposits from an overflowing lava tube; they are, instead, stratified mare formations. Their inclinations at the rim of the rille suggest that they got that way in an explosion throwing material up and out of the rille. Symbols: A. Predictable on basis of theory; B. Permissible in terms of theory; C. Permissible, but difficult to explain; O. Apparently irrelevant in terms of theory; X. Evidence precludes theory. And a bit of a case can, perhaps, be made for the electrical-eruption hypothesis on the grounds that rilles of apparently similar ages do not intersect one another. The strong charges transiently assembled in rilles by the breakdown mechanism could be expected to make them repel one another. The magnetic fields of the coursing currents, on the other hand, could be expected to align adjacent streams and pull them together. There seems to be a hint of such attraction-repulsion effects having played a role in steering the rilles near Prinz Crater. Rima Prinz II starts out on a course that, were it continued, would cross that of Rima Prinz I. Before that can happen, however, Rima Prinz II makes a sharp right turn, as viewed in the downhill direction. In the meantime, perhaps itself influenced by another rille reaching out from the direction of Aristarchus, Rima Prinz I makes a similar right turn of its own. The two keep their distance, but Rima Prinz II, perhaps further influenced by another, smaller rille to its right, is forced to traverse a ridge of high ground. These effects, of course, presuppose that all the rilles involved are simultaneously in the act of propagation. And whether such territorial give and take is real or imaginary, it is only of tangential interest to the basic hypothesis of rille formation. Rilles of different ages might well intersect one another's paths. Lunar Orbiter 4's High-Resolution Frame 137 shows an area northeast of Gassendi Crater—an area particularly prone to rille-formation. Schubert, Lingenfelter, and Peale reproduce this frame and claim that it shows a confluence of two rules (43). In my opinion, however, it shows, not a confluence of rilles, but a crossing of a later rille over the line of an earlier one. At the point of crossing, and for some distance each way from that point, the older rille is indistinct, although not indistinguishable, as if it has been partially submerged under a blanket of lateral ejecta from the rille that crosses it. Table I summarizes the known characteristics of lunar sinuous rilles and indicates what I believe to be the competence of all the recent theories offered to explain them. Admittedly, a measure of subjectivity is involved in any such attempt to rate rival theories. Nevertheless, I suggest that the evidence against erosion theories is overwhelming. The gaseous-outburst theory of Schumm fares better, but it suffers from irrelevance at a number of critical points. To my mind, the electrical-eruption theory offers logical answers to each of the mysteries that have plagued the other theories. An electric current flowing through an underground breakdown channel on a waterless planet like the moon would necessarily be flowing in molten rock. The breakdown mechanism is dielectric breakdown, and more specifically, thermal breakdown, the peculiarities of which are discussed in some detail by Whitehead (44). I mention this here only to establish that, in order to flow, the electric current must first melt the rock. And as a consequence of this, one would expect evidence of such melting to be present in the ejecta blanket spread over the rille surroundings. "The particle types in the Apollo 15 soils are similar to those in the soils from the previous missions in most respects. The major difference is the presence of green glass spheres ... different from any glass component previously observed in lunar soils [emphasis added-R.E.J.]. They are remarkably homogeneous and nonvesicular and are identical to the green glass found in sample 15426 . . ." Sample 15426, "an unusual green material" from the rim of Hadley Rille, is a breccia "consisting of more than 50 percent green glass occurring as spheres and fragments of spheres . . ."
Could these green glass spheres be derived from an underground stratum melted by breakdown currents that produced Hadley Rille? Laboratory analysis of the Apollo 15 green glass produced puzzlement, and the perplexity increased when the crew of Apollo 17 brought back some strange black glass. It was brought out at the Fourth Lunar Science Conference in Houston (March 1973) that "both the Apollo 15 and 17 glasses have markedly similar features that are distinct from other lunar glasses. These include: ... pits formed while the glass was hot and soft . . different from micrometeoroid pits in hard glass that are typically larger and always produce a spalling or shattering [and] splashes on the glass host sphere of material of the same composition, as if the partly molten glass pieces in a flying cloud were colliding." Experiments conducted on the Apollo 17 glass indicated that "cooling rates of faster than 1,000F/sec. were necessary to form the glass. Such cooling rates are virtually impossible in volcanic eruptions . . . but are expected in meteorite impacts." But in the same conference it was noted that "impact glasses tend to be non-uniform, since they are a product of an explosive process that mixes a diverse group of surface and subsurface rocks" (46). If the uniform, clear green glass from the Apollo 15 site derived from a single, rather homogeneous formation melted in situ by dielectric breakdown, its uniformity and non-vesicular structure would be no mystery. It might be instructive to determine the relative breakdown strengths of various lunar rocks and to investigate the possibilities of duplicating the green glass by subjecting a few Apollo 15 rock samples to dielectric breakdown. Schubert, Lingenfelter, and Peale have prepared a map showing the distribution of lunar sinuous rilles (47). They remark: "The nonrandom distribution of the sinuous rilles is immediately obvious. The rilles are clearly associated with the mare material and are conspicuously absent from the highlands. The tendency of the rilles to occur in groups is also evident." This tendency to occur in groups is something of an understatement. What strikes me about this map is the dense concentration of sinuous rilles in the neighborhood of the crater Aristarchus. Dots marking rille locations in this region frequently overlap, making it difficult to count them. A quick count nevertheless indicates that more than 40 of these features are within 300 kilometers of Aristarchus, and upwards of 70 are within 500 kilometers. The crater Aristarchus has become well-known as the center of a small area on the moon that occasionally emits visible light (48). In 1967 Barbara Middlehurst of the University of Arizona's Lunar and Planetary Laboratory published "An Analysis of Lunar Events"—color changes, glows, and other signs of lunar "activity"—reported over the last four centuries (49). Of some 400 such events, she noted that "the most active region is certainly around the crater Aristarchus, the neighboring Schroeter's Valley and the Cobrahead [the "pear-shaped crater" at the upper end of Schroeter's Valley]." 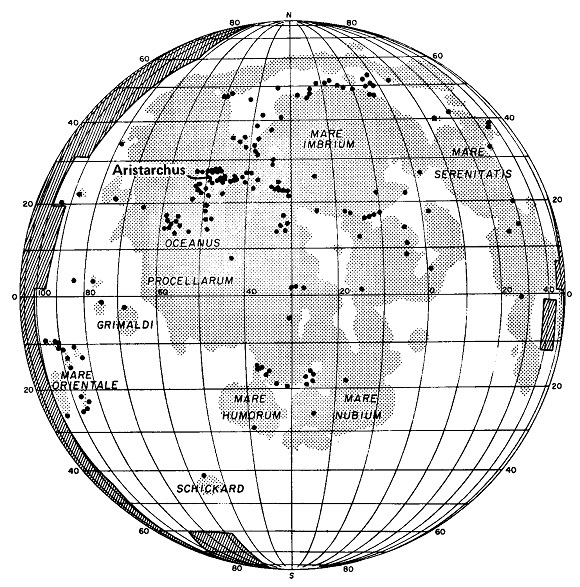 The Aristarchus region has also been identified by gamma-ray spectrometers flown in lunar orbit during the Apollo 15 and 16 missions as one of three localities on the moon showing enhanced radioactivity (50). Even more compelling is the finding of Apollo 15's alpha-particle spectrometer, "designed to detect alpha particles from radon decay and to locate regions with unusual activity on the moon": "The region containing the highest count rate is approximately centered on the crater Aristarchus but also includes Schroeter's Valley and nearby regions" (51). The authors who reported the alpha-particle results, Paul Gorenstein and Paul Bjorkholm, both of American Science and Engineering, point out that "the excess ... Rn at Aristarchus is at least a factor of 4 higher than the lunar average"; "the size of the Aristarchus feature that can be seen above the background [count] is at most 150 km in extent"; and, since the Apollo 15 gamma-ray spectrometer indicated at most a 50-percent increase in uranium concentration in this region, relative to adjoining areas, "the increase of "'Rn activity in the region of Aristarchus must be caused primarily by a local increase in the rate of [radon-gas] emanation." Their report concludes: ". . . it is not unreasonable to conjecture that the observed radon emanation from Aristarchus ... is associated with the same internal processes that will on occasion emit volatiles in sufficient quantity to produce observable optical events." All this seems to suggest that something happened quite recently at Aristarchus, at least on a geologic time scale. Could it be that this crater—actually the brightest spot on the face of the moon today—was created by a discharge from Mars in the eighth century, B.C.? Earlier, we speculated that electrons responding to local ground fields might have assembled at a number of points on the lunar cathode simultaneously. It is quite conceivable, then, that breakdown would occur at many of these locations at practically the same instant, and that the initial surge of electrons headed for Mars would be a complex of individual streams. Would it be likely, in such a set of circumstances, that the resulting mainstroke discharge (to borrow a term from the nomenclature of lightning phenomena), or discharges, would be limited to one, or a very few, streamer channels? It is also pertinent to ask whether the motions of the two planets, particularly differential rotational motion between the opposing faces of Mars and the moon, might distort discharge channels and displace their termini appreciably. The speed of propagation of avalanching electrons is of the order of 107 cm/sec (53). And the return streamer travels (propagates) at a speed of about 108 cm/sec (54). We can only guess how far apart Mars and the moon may have been during the consummation of their love affair. Something less than several thousands of kilometers might have brought gravitational disruption to one or both of them. So let us suppose that they approached to within, say, 5,000 kilometers, or 5 x 108 centimeters, before breakdown occurred on the moon. From the figures given above, it is apparent that the Kanalaufbau mechanism then could have bridged the gap between the two planets within approximately one minute after the onset of rille eruption. It follows that relative motions between the opposing planetary surfaces could have only negligible effect on streamer-touchdown points. The clustering of lunar sinuous rilles on the map prepared by the University of California scientists is hardly so well-defined as one might wish. Even the concentration of points near Aristarchus is splotchy, and isolated points are scattered over nearly all mare surfaces on the near side of the moon. Less spectacular concentrations than that about Aristarchus might be associated with the rayed craters Eratosthenes, Eudoxus, Aristillus, etc., many of which are larger than Aristarchus. But the concentration of sinuous rilles in the neighborhood of Aristarchus is so impressive that we are almost compelled to focus attention on that area, particularly since other lines of evidence seem to converge there, too. On the evidence that the Aristarchus region suffered the most rille eruptions of any such concentrated area on the moon, and supposing that in a rough sort of way rille numbers can be correlated with numbers of electrons contributed to the establishment of discharge channels between Mars and the moon, we seem justified in theorizing that this same region would receive the hardest blow from a main stroke. And the crater Aristarchus must be the result of that blow. A clear implication of such a chain of deduction is that Aristarchus was not in existence when the local sinuous rilles were formed; that it is younger-if only by a matter of a minute or so-than the eruption features surrounding it. To check this out, let us re-examine photographs of the area. The mapping camera aboard the Apollo 15 command module obtained a superb shot of this complex terrain (55). The view, from the north, shows Schroeter's Valley originating on a rise that is clearly older than both Aristarchus and nearby Herodotus, since both craters cut into the flanks of the rise. Herodotus, in turn, is older than Aristarchus (56). Small rilles are fairly numerous in the scene, but any of them that approaches within about 80 or so kilometers of Aristarchus seems to have its outlines softened, as if material ejected from that crater had partly buried it. No rille in the area originates on high ground or traverses high ground that can be identified as an elevation produced in the Aristarchus event. The same conclusions can be drawn from Lunar Orbiter 4's High-Resolution Frame 150-1 (57). To date, no mission to the moon, manned or unmanned, has returned lunar samples from the Aristarchus region. We may anticipate, however, that when and if such samples are secured, they will be pronounced to be three or four billion years old. Accepted dating techniques based on radioactive decay will be applied, and that will be that. It will be concluded, therefore, that the Aristarchus explosion took place, not three, but millions of millennia ago. Velikovsky (58) has already offered a number of valid reasons why such dating methods should be suspect: (i) "uncorrected" potassium-argon ages of lunar materials make some of them older than the inferred age of the universe itself; (ii) lunar materials are strikingly deficient in certain volatile elements, a fact which casts strong doubt on the credibility of uranium-lead, thorium-lead, and rubidium-strontium age determinations; and (iii) no account is taken of the possible effects of electrical discharges on lunar materials. And Velikovsky pointedly asks: "When we measure the age of the universe, why do we assume that at creation the heavy elements like uranium predominated and not the simplest ones, hydrogen and helium? It is philosophically simpler to assume that all started—if there ever was a start —with the most elementary elements. A catastrophic event or many such events were necessary to build uranium from hydrogen. Although the radioactive clock cannot be disturbed by heating or hitting, it can be disturbed by discharges of interplanetary potentials. . ."
The cosmologist will, of course, reply: "We do assume that the heavy elements have been built from the lighter ones, starting with hydrogen; it starts in stars like the sun, and the ultimate creation of the heaviest elements takes place in supernova explosions." But Velikovsky's point -and it's a good one—is that no theorist stops to consider the atomic-fusion possibilities of the electric discharge; the uranium-lead ratios found in the rocky materials of the universe may just as easily reflect a partial conversion of lead to uranium as a decay of uranium to lead. But of course the stumbling block here is the continuing resistance of theorists to the idea that electrical discharges have taken place, or ever could take place, on a cosmic scale. In view of the credibility gulf surrounding the entire premise of radioactive dating and the attendant assumptions that deny the moon any kind of history for the last three billion years, it seems reasonable to look to other kinds of evidence in an effort to determine the age of the crater Aristarchus. And of these other kinds of evidence, we have already noted the appearance, the stratigraphic relationships, the intense radioactivity, and the luminous emissions from this site. Everything that is known about this crater argues in favor of its youth. It would be an exercise in futility at this time to attempt to pin down the exact moment when Aristarchus first appeared as a scar on the face of the moon. Perhaps future generations will develop both the curiosity and the means to attack this problem and will finally be able to assure us that this crater was or was not born in the eighth century. (1) I. Velikovsky, Worlds in Collision (New York: Macmillan, 1950), Part II, "Mars." (3) W. Schwabacher, "The Olympian Zeus before Phidias," Archaeology 14 (June, 1961): 104-9. (4) W. Bostick, Scientific American 16 (October, 1957): 87-94. (5) Plasmoids, though uncharged, are carriers of concentrated electric and magnetic energy. The impact of a cosmic plasmoid could produce an earth-shaking—perhaps even orbit-changing-explosion. According to Bostick, plasmoid velocities in his vacuum experiments were "Comparable to the speed of stars in galaxies and of flares shooting out from the sun"—which is to say, fast enough to travel from Jupiter to the orbit of Venus in the space of a month or so, but not so fast as to blur the form and surface details of such an object. (7) J. D. Cobine, Gaseous Conductors—Theory and Engineering Applications (New York: Dover, 1958). Cobine taught electrical engineering at Harvard University before moving on to be a physicist at the General Electric Research Laboratory. Though I have never corresponded with him, he can rightly be held responsible, through this volume, for turning me on as an electrical-discharge fanatic. (8) L. Loeb, Fundamentals of Electricity and Magnetism (New York: Dover, 1951), p. 501. (9) B. J. Ford, Spaceflight 7 (January, 1965): 13-17. (10) New York Times, early city edition, July 21, 1969. (11) Velikovsky, Worlds in Collision, "The Moon and Its Craters," pp. 360-2. I am afraid I find this concept difficult to accept; particularly, the problem of getting molten rock to hold together as a membrane of thousands of square kilometers while gas pressure elevates it from below seems insurmountable, and I have to go along with Baldwin (The Measure of the Moon !Chicago: University of Chicago Press, 1963 p. 392), who finds this mechanism for dome-formation "completely impossible physically." (12) This, of course, in no way excludes the rayed craters from consideration in the present inquiry. Indeed, to my way of thinking the rays are strong evidence that the craters associated with them are electric-discharge touchdown points. The rays appear to be Lichtenberg figures—starlike patterns produced on dielectric surfaces by electric sparks. They have no discernible depth on the lunar surface—a point consistent with the idea that they are purely superficial markings produced by avalanching electrons. The pity is that Lichtenberg, who discovered this phenomenon almost 200 years ago, has had his name attached to a small lunar crater of no particular prominence and apparently lacking rays. (13) I. Velikovsky, Memorandum to Space Science Board, National Academy of Sciences, May 19, 1969, published in Pensée 2 (fall, 1972): 29; see also R. Treash, Pensée 2 (May, 1972): 21. (14) F. R. Moulton, An Introduction to Astronomy (New York: Macmillan, 1910), p. 268. (15) W. H. Pickering, The Moon (New York: Doubleday, Page and Co., 1903). (16) Quotations from Pickering in these last two paragraphs are from V. A. Firsoff's Strange World of the Moon (New York: Science Editions, Inc., 1962), p. 159. (18) The Nature of the Lunar Surface, ed. W. N. Hess, D. H. Menzel, and J. A. O'keefe (Baltimore: Johns Hopkins Press, 1966), pp. 107-21. (19) H. Urey, Nature 216 (1967): 1094. (20) J. A. O'Keefe, Science 163 (1969): 669. (21) J. A. O'Keefe and E. W. Adams, Journal of Geophysical Research 70 (1965): 3819. (22) W. S. Cameron, Astronomical Journal 68 (1963): 275. (23) R. E. Lingenfelter, S. J. Peale, and G. Schubert, Science 161 (19 July 1968): 266-9. (24) J. E. M. Adler and J. W. Salisbury, Science 164 (2 May 1969): 589. (25) S. A. Schumm and D. B. Simons, Science 165 (11 July 1969): 201. (26) Scientific American 223 (November, 1970), "Science and the Citizen." (27) R. Greeley, Science 172 (14 May 1971): 722-5. (28) Lunar Orbiter 5 photographed a "unique ridge-rille" northwest of Gruithuisen Crater. This rille appears to be a chain of oval craterlets joined by short imperfectly aligned rille sections. See Sky and Telescope for March, 1971, p. 172. (29) Ranger 8 and 9, JPL Technical Report 32-800, Part II (1966), p. 35. (30) G. Schubert, R. E. Lingenfelter, and S. J. Peale, Reviews of Geophysics and Space Physics 8 (February, 1970): 199-224. (31) Science 175 (28 January 1972): 407-15. (35) Science 175 (28 January 1972): p. 409. (36) Scientific American 224 (September 1971), "Science and the Citizen." (37) B. Hapke and B. Greenspan, EOS Transactions, American Geophysical Union 51 (1970): 346. (38) The electric-field-confining capabilities of space-charge sheaths are discussed in Pensée 2 (Fall, 1972): 6-12. (39) H. G. Booker writes: "For each dielectric there is a maximum strength of electric field that the dielectric will sustain. If the electric field is too strong, the distortion of atoms . . . becomes so great that electrons begin to part company from their atoms. The insulating properties of the dielectric then 'break down,' and there is a temporary discharge of the system through the dielectric ... The maximum electric field strength that a dielectric will sustain without breaking down is known as its dielectric strength and depends upon the molecular structure of the dielectric ... In designing capacitors it is desirable to avoid sharp points and sharp edges that would produce locally high electric fields and encourage breakdown of the dielectric . . ." (An Approach to Electrical Science [New York: McGraw-Hill, 1959], p. 70). (40) P. E. Viemeister, The Lightning Book (New York: Doubleday, 1961), p. 137. (41) A. W. Graubau, Principles of Stratigraphy, vol. 1 (A. G. Seiler, 1924; New York: Dover,1960), p. 72. (42) Apollo Lunar Geology Investigation Team, "Geologic Setting of the Apollo 15 Samples," Science 175 (28 January 1972): 411. (43) G. Schubert, R. E. Lingenfelter, and S. J. Peale, Reviews of Geophysics and Space Physics 8 (February 1970): 204, figure 5. (45) "The Apollo 15 Lunar Samples: A Preliminary Description," Science 175 (28 January 1972): 363-75. (46) W. H. Gregory, Aviation Week & Space Technology (17 April 1973): 38-42. (47) G. Schubert, R. E. Lingenfelter, and S. J. Peale, Reviews of Geophysics and Space Physics 8 (February, 1970): 207. (48) CL J. A. Greenacre, Sky and Telescope 26 (December, 1963): 316. (49) B. Middlehurst, Reviews of Geophysics 5 (May, 1967): 173-89. (50) Science 179 (23 February 1973): 800-3. (52) H. Raether, Electron Avalanches and Breakdown in Gases (Washington, D.C.: Butterworths, 1964), p. 113. (53) L. Loeb, Fundamentals, p. 493. (54) H. Raether, Electron Avalanches, p. 125. (55) This photograph is reproduced on p. 200 of Sky and Telescope for October, 1971. (56) This age difference between Herodotus and Aristarchus is generally accepted, since light-colored ejecta from Aristarchus can be seen inside the rim of Herodotus. (57) Reproduced by Schubert, Lingenfelter, and Peale, Reviews of Geophysics and Space Physics 8 (February, 1970): p. 200. Hadley Rille, at the Apollo 15 landing site, does not appear to be one of a cluster of rilles, nor does it appear to be overrun to any significant degree by ejecta from a return-stroke crater. Perhaps we might look to nearby craters Aratus and Hadley A as touchdown scars of a multiple or branching streamer to this area. "Aratus and Hadley A are extremely enhanced in the 3.8-and 70-cm radar [images] and in infrared [observations], are bright in full-moon photographs [a typical rayed-crater phenomenon], and also appear fresh, blocky, and sharp in the high-resolution Lunar Orbiter photographs. There appears, therefore, to be an extensive field of decimeter- and meter-sized rocks surrounding these craters [to judge from the radar results] and extending out to about 10 km from each of these craters. These features suggest that Aratus and Hadley A are very young.... (S. H. Zisk, et al., Science 173 [27 August 1971]: 808-12)." Both Aratus and Hadley A are several tens of kilometers from Hadley Rille, and their ejecta blankets do not reach that far. (58) I. Velikovsky, "When Was the Lunar Surface Last Molten?" Pensée 2 (May, 1972): 19-21. Note added in proof: Loeb (Electrical Coronas, Berkeley, Univ. of California Press, 1965, p. 69) refers to "Raether's proof of convergent avalanches initiating breakdown streamers." This appears to be at least partial confirmation of the surmise expressed here.